From left, Sandy Lees, Jo Ann Johnson, Jolane Gardner and Dolores Davis are members of the Midwest City, Meadowood Soldier Card Project. The group is preparing to send Valentine’s Day cards to men and women in the military serving overseas, as well as to patients at Veterans’ Hospitals in Oklahoma City and Norman. 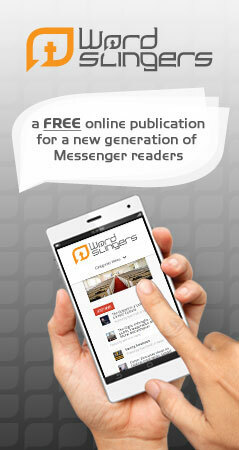 MIDWEST CITY—Jolane Gardner and her friends care enough to send their very best. Hallmark may be the standard for greeting cards, but the national retailer may not have the impact these ladies have on American service men and women. Last year, Gardner started a ministry group called Soldier Card Project at Midwest City, Meadowood. 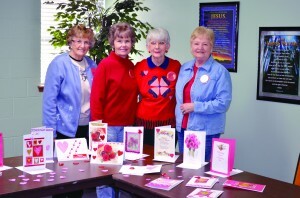 This team of ladies meet weekly, making greeting cards from used cards. The Soldier Card Project team have sent more than 1,000 cards to military personnel overseas, as well as patients at the Oklahoma City and Norman Veterans’ Hospitals. Gardner said most patients at the VA hospitals never get mail, and the group wanted to support them as well. Recently, they received a letter from a soldier serving in Afganistan who was touched by the groups’ greeting cards. The group has been featured in the Oklahoman’s “Melba’s Swap Shop” column, and the feature has attracted others to participate in their weekly meetings. The Soldier Card Project meets from 9 a.m.-Noon Mondays at Midwest City, Meadowood, 2815 N. Woodcrest Dr. Those interested in participating may call Gardner at 405/736-1244 or 476-1244 or email her at [email protected].